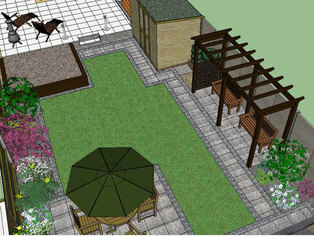 Below are some examples of designs already carried out by Postal Garden Design. These pictures are low resolution pictures to allow for faster loading but the true high resolution pictures you get with your design show much greater detail. To see a bigger version, simply click on the pictures. 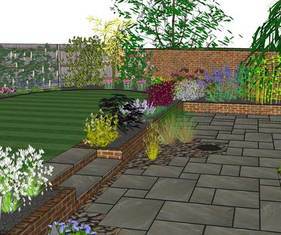 This view shows a simplified design with the planting layout drawn in over the top of the design. Each circle is labelled and corresponds to a numbered list of plants alongside. 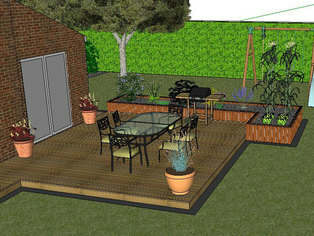 This area of a garden includes a large decking area slightly raised above the lawn with a raised bed built with round timber logs alongside. A brick mowing strip around the raised edges makes mowing much easier. This front garden provides parking for two cars and easy access from both sides to the front door. Low maintenance planting and cobble areas provide decoration with a post and stainless steel horizontal balustrade forming the boundary. Another front garden laid with a generous block paved drive for two cars with room to walk around with ease. Lawns on either side of the drive are surrounded by decorative shrub planting. 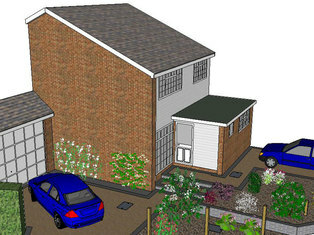 This shows an example of a finished design as a plan view. This view can be useful for setting out when building the garden. Other views help with level changes but this one where each feature site in the garden. 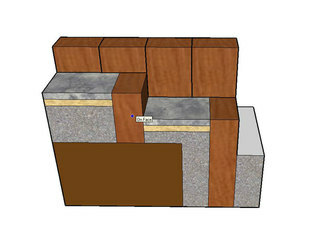 This example shows a construction detail of a set of steps built using railway sleeper risers and paved treads with a sleeper retaining wall behind. The finished drawing will be labelled to show materials and layout. 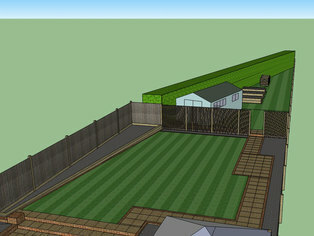 A design for a family garden with several uses. This area includes a patio and shrub areas with a lawn edged with blocks to ease maintenance. A raised vegetable garden provides home-grown produce and the young children are able to assist with this. 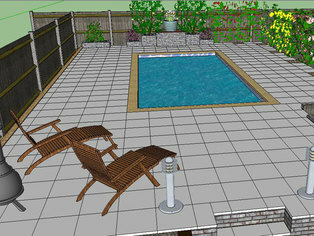 A garden design showing an area of garden surrounding a swimming pool. 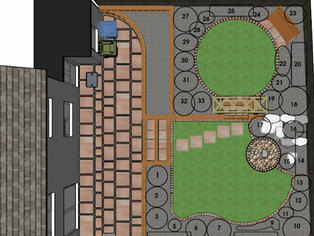 Much of this area is to be left as is with only minor modification but it helps to envisage the overall scheme if the entire garden is shown. 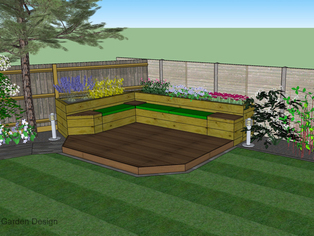 This design is for a cosy entertainment area pitched at one end of a drive area to catch the evening sun. A built in barbecue and comfy seating are all surrounded by rendered raised beds planted with a mixture of small shrubs to provide scent and decoration. 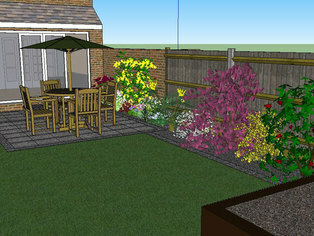 With 3D garden design it is possible to show the garden as if you were looking out of an upstairs window which can give a much better perspective of the garden layout as this picture shows. You can always ask for specific views of the final drawing to be sent. An initial draft is a basic layout drawing and does not contain any additional decoration such as planting, furniture, pots, etc. so that the drawing outline is very clear. 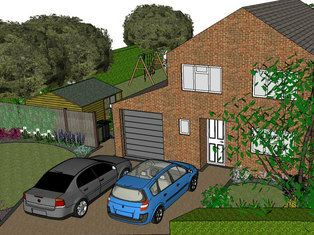 Only when the design has been approved will these additions be added to give a more finished view. This is part of a large garden where only a small part of the garden is being re developed. This is an example of a draft design and as such, some of the detail is missing. 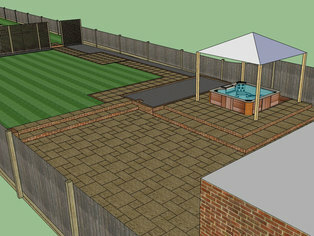 This gives the customer a good clear idea of the layout of the new garden. 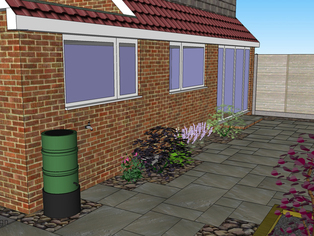 This is another example of a draft design showing the transition between patio and utility area. I am working on adding more "real" materials based on actual paving slabs etc. to the software so that accurate impressions can be provided of the built design. 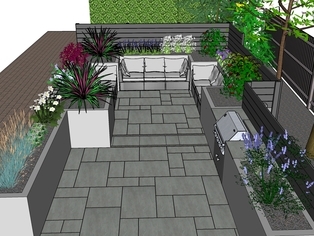 An example of the basic draft detail contained within a garden design. 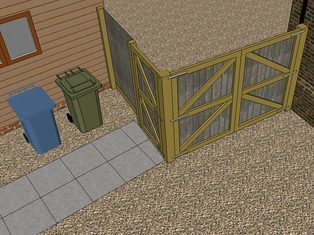 These items are all drawn from scratch or purchased from a bank of items to show exactly how features work together and how practicalities such as bins are incorporated. 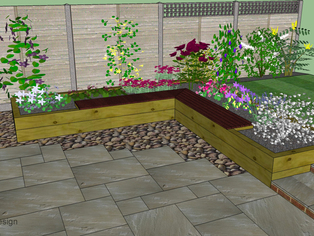 This is an example of a small sloping garden that has been made much more usable with a simple terraced layout. With two small children, level lawns needed to be as large as possible and a deck was required to catch the evening sun. 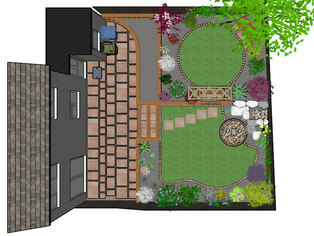 This is a draft design without any plants or accessories to show the exact layout in a simple form. 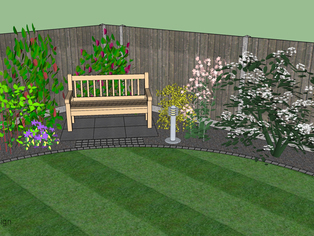 This version is used to discuss the general layout before adding the planting and accessories to complete the design. Another example of a draft design shown in its simplest form. 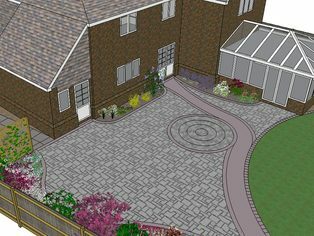 The existing garden was a very eclectic mix of features and it was very difficult for the customer to see how the garden could be transformed, hence the very simply drawn design. 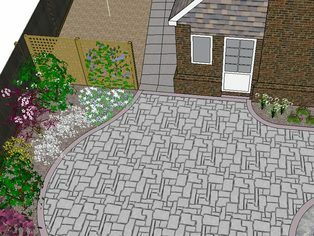 A small garden design with a circular lawn edged with granite setts to compliment the granite patio. A timber bench nestles on a small paved area in amongst shrubs for a secluded feel whilst the lighting allows the area to be used at any time. 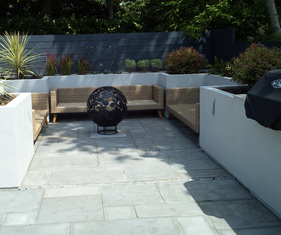 Another seating area built with sleepers to a bespoke design. A hardwood deck if front provides a solid base whilst the seating behind is built around standard sized cushions. Lighting allows the area to be used at any time and planting adds to the decoration. A close-up of the fine detail achievable using this method of design. 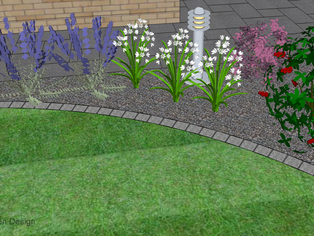 This shows a bollard light amongst planting alongside a path leading from a patio to a seating area. 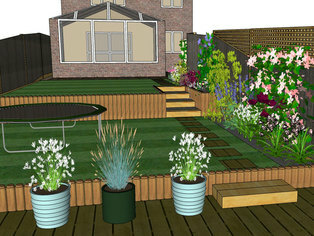 Views of the garden design can be created from any angle and in any detail. This view shows a raised sleeper bed built to retain the higher ground behind. The bed includes a hardwood bench and planting and acts as a low divide between the patio and the lawn area of the garden. The gravel helps to extend the paving and provides drainage. 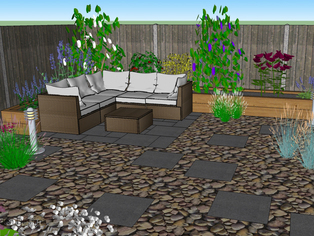 A corner of a small garden design aith a paved seating area designed to accomdate a particular set of Ikea furniture. The gravel and planting around make the area softer and also provide drainage areas for the main patio. Lighting allows the area to be used at night. 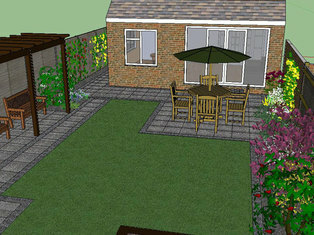 Details can be added to any garden design to make the image more realistic to the client. In this case, the simple addition of an outside tap gives good reaon for the paving to be laid up to the house wall in that particular area. 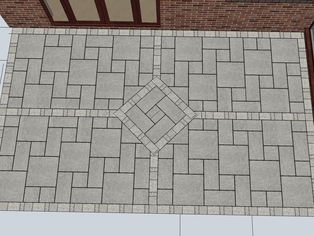 This drawing shows a draft design for a patio in which each quadrant is mirrored to the others. A different design in the center adds a focal point to the area which provides a large patio area for a good sized family house.